The new PROSTAFF 7i, which boasts a sleek, ergonomic design, is a further evolution of the PROSTAFF 7 which was released in 2013. Long-distance measurement of up to 1,200 metres (1,300 yards) in actual distance is achieved. Nikon's original data-processing algorithm HYPER READ is employed for displaying the measured distance with a fast, stable response regardless of how far you are from the target. It displays the measurement result in approx. 0.5 second, ensuring stress-free measurement. 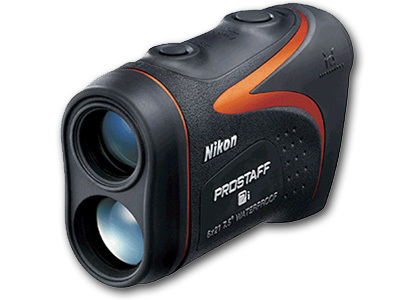 ID technology for displaying horizontal distance, and other useful functions that were highly acclaimed for the PROSTAFF 7 are inherited. These include the Target Priority switching system and continuous measurement, which are field-proven features of the PROSTAFF 7. The Target Priority switching system lets you switch between Distant Target Priority mode and First Target Priority mode depending on subject conditions. Distant Target Priority mode is useful in heavily wooded areas where your subject may be partly obscured by bushes and undergrowth. On the other hand, First Target Priority mode allows you to measure the distance of the closest subject — useful when measuring the distance to a subject in front of an overlapping background. Continuous measurement is available for up to 8 seconds by just holding down the POWER ON/Measurement button. Measurement of the distance to a moving target is accomplished without any worries about hand movement. Users are certain to enjoy the PROSTAFF 7i's small, lightweight body that is easy to grip. Simple operation is complemented by a waterproof structure resistant to damp or rainy weather conditions. Measurement range (actual distance)	7.3-1,200m/8-1,300 yds. Auto power shutoff function equipped after 8 sec.